Want to shop early? SELL WITH US! for Elk Grove families all under one roof! 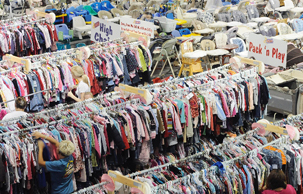 Shop 20,000 square feet of bargains! Everything's organized by size, gender and category. Click GET TICKETS above to Get a Free Admission Pass! All Team Members and Consignors also SHOP EARLY at the Half Price Sale Friday. Join our Email list to get all the information about the coming events. We email a notice for each event, twice a year. You can SHOP EARLY at the sale and receive important information about the coming events. Choose GET TICKETS at the top of this page to get your early shopping pass. "ease of set up, good prices, good selection"
I really like the ease of the valet tagging.